Should be Canada Legal as it shoots at only 240 fps! That is cool, but might be in the same category as crossbow pistols are and they shoot slower. Something about being able to fire one handed. Altho, it’s technically not a bow. Crossbows designed to be fired with one hand and crossbows measuring less than 500 mm in length are prohibited. 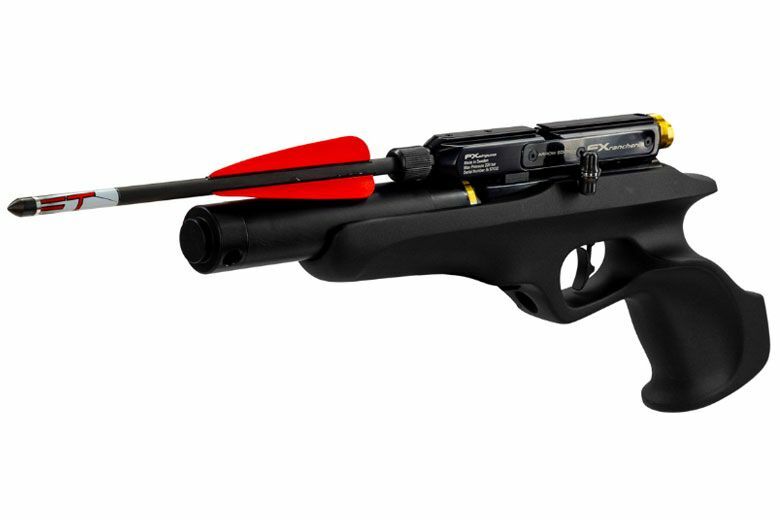 However, crossbows shorter than 500 mm or which can be fired with one hand are banned in Canada, says Pam Goode, legal counsel for Ontario’s chief firearms officer. FX Ranchero is only 440mm but thats the airgun model. The Arrow would be shorter. very cool--- but no way in Canada. I,m surprised playing darts is legal here still. I got this one from princess auto it,s called the seeker. legal here because it has the stock which is used for cocking it. 80lb draw and 200 fps . it,s a hoot to shoot. Might want to wait until the smoke clears after the gov't passes C71 or maybe NOW is the time to get one. 2 schools of thought. Yeah, hard to say... I’d grab one but that’s a little steep for 8 shots that aren’t really useful for more than very small game if even legal. For 1,400 snackers I'd have a red-dot sighted .500 S&W. Might have to add a couple hundred to that, or buy used from someone who didn't like the recoil.